As a parent or carer, you are your child's best teacher. By making them aware of road safety issues both inside and outside the car you can reduce the risk of them being injured or killed in a road accident. Children have difficulty judging speed or distance until they are at least eight years old. Chat to them about what you are doing when you are out and about. Think before you cross a road that you are showing your child a safe example. what should you always wear in the car? 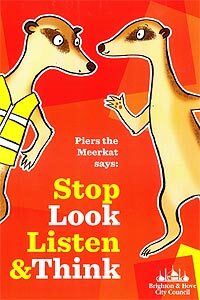 why should you look and listen as you cross the road? Answer these questions and more and test your road safety knowledge. More information and advice for pupils, teachers and parents at Safety Matters and 3M Streetwise. Are you street wise? Thinking of learning to drive or ride a motorbike/moped? Do you take cycle safety seriously? Do you know that you could be breaking the law if you are over 14 and not wearing a seatbelt? For further information contact the Road Safety Team.